Traveling to Cuba is getting to know a different culture with places full of natural and architectonics beauties. Visiting ‘La Perla del Sur’is finding marvelous places. In Bed and Breakfast in Cuba, we will tell you what to do in Cienfuegos. Keep reading and take notes for your next trip to the island. The city of Cienfuegos is at about 245 kilometers far from Havana, in the Majagua peninsula, just by the shore of the Jaua Hay. The city is called ‘La Perla del Sur’, besides for its location in Cuba's south, the name comes from the beauty of this town capable of captivating everyone's who visits it. The name Cienfuegos comes from the general Capitan Jose Cienfuegos Jovellanos. Cienfuegos was founded on April 22 of 1819 by the French colonists during the Spanish reign. Its first name was Fernandina de Jaua in honor of King Fernando VII and to the indigenous that lived there. Then, in 1829 the king authorizes the name change to Cienfuegos. In 2005 the historical urban center of Cienfuegos was declared by the UNESCO as Cultural Heritage of Humanity. Because if the architectural beauty that this part of the city has and can show to the world. 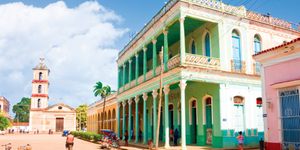 Without a doubt, Cienfuegos and any other city are gems of culture and history. 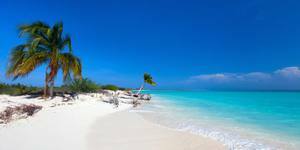 Every one of them has a different charm, but that is not everything, there are also beaches you should visit on your trip to Cuba. The Paseo de Padro is the biggest in the whole country. It has an extension of nearly 2 kilometers. The father Bartolomé de las Casas was a religious Spanish man that left everything behind to become a defender of the rights of the natives that lived in Cienfuegos. Cienfuegos is the only Latin-American city that was founded by the French while the Spanish where on the government. In 1995 de historical center of Cienfuegos was declared National Monument. Cienfuegos amaze anyone who visits it. The city has so many places you can see, it has a beauty to appreciate. It is also a tourist attraction for its beaches and the chore. 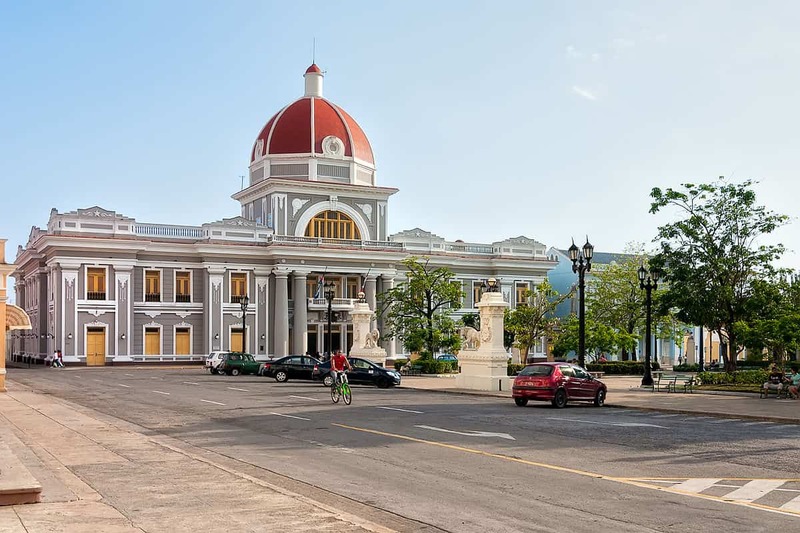 Here are some places you should see in Cienfuegos the next time you visit Cuba. Visiting the streets of the historical urban center of Cienfuegos is one of the main activities you can do in the city. In there you will find the Botanical garden, the Queen Cemetery, and the Tomas Terry Theater. While visiting this place you will notice that it does not have a typical colonial look, like Havana. This is because of the architecture influence of the French, who founded the city. Its style can be considered more neoclassical. The ‘Palacio de Gobierno’ is near the Jose Marti Park, in the middle area of the historical center of the city. Its architectural structures make the difference between this building and the other ones in the city. This building has had some restored, the first one un 1957 in its structures. This has allowed that over the years the building remains in optimal conditions for the enjoyment of those who visit Cienfuegos. Another restored happened in 2006 when the stairs where renovated and the city's coat of arms was recreated. The Ferrer Palace takes its name in honor to the family that made it built. The Catalan origins of the family had a big influence on the design of this place. It had a very modern look for the time. Besides the palace, you will see the arch of triumph. This is a tribute to the independence of Cuba. An interesting fact is that it was built by the city workers for free. 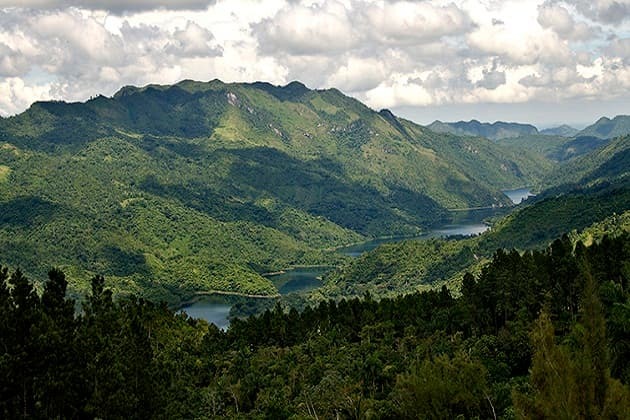 This massif was called the highs of Sancti Spiritus, it is part of one of the most important mountains groups in Cuba. Its highest point is about 1140 meters. In this mountain systems, it is possible to appreciate the flora and fauna of the place. Besides, it has rapids, jumps, valleys and more, that makes this place ideal to get in touch with nature. Here they grow coffee, it is one of the main agricultural activities in the place. So, there you will be able to enjoy a great coffee when you visit de Macizo de Guamuhaya. Rancho Luna beach is quite crowded with tourists, especially in the summer. It has many marine species. There you can practice different water sports, such as diving, kayaking, and water bikes. 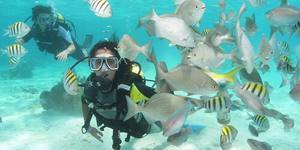 The concentration of corals makes activities such as snorkeling and diving very interesting for those who visit it. Remember to in Casas Particulares in Cienfuegos, the locals will help you to find the best spots in town. The boardwalk is quite large, at the end you will see Punta Gorda, this is a residential neighborhood dedicated to tourism in Cienfuegos. As it is a bit far from the city center, it is best to take a bicycle. On the way, you can see the Sculpture Park. An open-air museum that has more than 30 artworks of the surrealist genre of different artists of international stature. When arriving at Punta Gorda, you will enjoy one of the best views of the sunset that Cuba can offer. In addition, you can find different bars and restaurants, the area is quite warm, so the refreshing drinks will be appreciated. 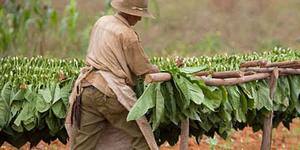 The natural complex is located between Cienfuegos and Trinidad, very close to Guamuhaya. Its name means place of fish. Around there is an exuberant flora and fauna that is worth knowing. The different marine landscapes that make it up, so practicing activities such as diving is very interesting. These were different options on what to do in Cienfuegos, visiting ‘la Perla del Sur' will be an amazing experience. Without a doubt, the city has a lot to offer. To know it is to fall in love with its architectural and natural beauty. If you are interested in visiting this place or any other of Cuba, contact us.